Aliminium venetian blinds continue to grow in popularity due to their ease of use and varied shading qualities. Varying colours and shades are continually being added, giving a choice to satisfy most. There is a choice of slat sizes, 15, 25, 35 and 50mm, and a choice of control sides is given along with the opportunity to add certain safety features. 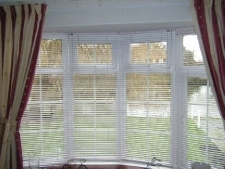 15 and 25mm venetians now come in the "Perfect Fit" system making them even more desirable.